Tap video to play or pause. The new Steinway & Sons Spirio is the world's finest high resolution player piano. A masterpiece of artistry and engineering in your home, Spirio gives you the ability to enjoy performances captured by great pianists — played with such distinction, strength and intensity that it is virtually indistinguishable from a live performance. Spirio, a handcrafted Steinway like all others, is the latest revolution in Steinway's history of ceaseless improvement in its mission — declared by Henry E. Steinway, "to build the best piano possible" — and brings the exceptional craftsmanship of the Steinway piano to your home along with innovative technology and the unrivaled musicality of Steinway Artists. The Spirio's high resolution playback system is able to illustrate the passion behind each Steinway Artist's performance by using proprietary software that can measure hammer velocity (up to 1020 dynamic levels at a rate of up to 800 samples per second) and proportional pedaling, for both the damper pedal and soft pedal (up to 256 pedal positions at a rate of up to 100 samples per second). The soft trills, delicate pedaling, and thundering fortissimos that put the world’s finest artists in their own category are reproduced with unmatched accuracy found only on the Spirio, precisely realizing both the pianist’s and the piano’s entire range of motion and emotion. With just one touch, the iPad provided with the Steinway & Sons Spirio connects with the Spirio app with hundreds of performances for you to choose from to bring your Steinway grand piano to life. This regularly and automatically updated library, exclusive to Spirio, features everything from J.S. Bach to Irving Berlin to Billy Joel, and allows the instrument to reach it's full expression, regardless of your playing ability. Check out the Spiro Spotlight for a monthly update on the Steinway & Sons Spirio catalog. 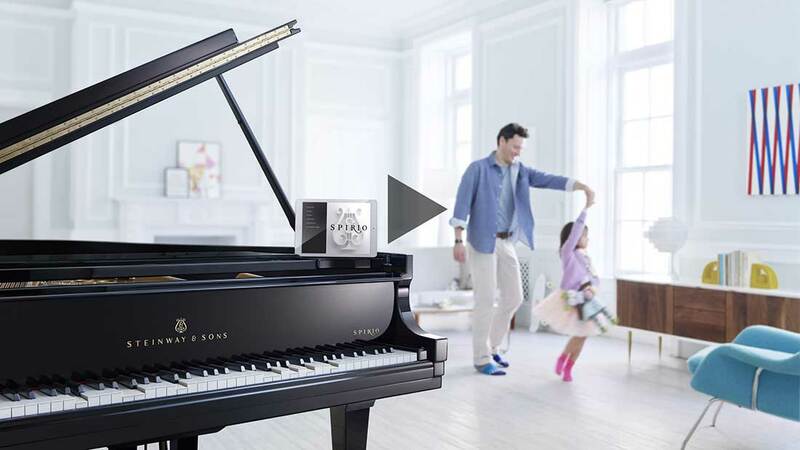 Spirio by Steinway and Sons is a new high-resolution player piano that provides an unrivaled musical experience, mirroring the quality of a live performance. Steinway Spirio breathes life into your living room with the world’s greatest music, independent of the listener’s playing ability. The technology used in the Steinway Spirio takes advantage of a proprietary high-resolution software system as well as solenoids (a current-carrying coil of wire) that actuate each note on the piano, and two pedal solenoids. This patented system was developed with the help of Wayne Stahnke, a pioneer of the modern player piano system. No, unlike other systems there is no mounted hardware visible on the piano. The only piece of hardware visible is the power cord. The Steinway Spirio system is installed directly into the piano itself at the time of manufacture, ensuring that the exterior beauty and performance you expect from any Steinway & Sons piano remains up to your standards. The Steinway Spirio is only available on instruments that are handcrafted in the Steinway & Sons factory by Steinway artisans. The Steinway Spirio is installed at the time of manufacture and cannot be installed on existing pianos. Three Steinway and Sons models will be available with the Spirio system: Model B (Classic Grand, available worldwide), Model M (Studio Grand, available in select U.S. and Canadian markets), and Model O (Living Room Grand, available in select European and Asian markets). This superior level of playback is made possible through a combination of proprietary high-resolution recording technology, and the Steinway Spirio’s ability to replicate smaller increments of velocity on both the hammers and proportional pedaling. The fact that the recordings are recorded and played on a Steinway & Sons piano dramatically increases the differences in performance quality when compared to existing products. There are three main points of differentiation. First and foremost, the Steinway Spirio is ultimately a Steinway & Sons piano; possessing the same level of superior craftsmanship that goes into every single piano the company produces. Second, we have perfected technology to capture a range of subtlety and nuance that has never before been possible. Third, owners will have access to the entire high-resolution repertoire recorded in the Steinway & Sons Studios by a roster of over 1,700 Steinway Artists, exclusively for the Steinway Spirio. At the time of launch, we will have approximately 50 hours of content with over 700 music files available in the core music catalogue. The library will continue to grow as we record more artists and consumers will be given access to all new recordings as they are made. © 2019 Music Gallery Clearwater | Steinway Piano Sales, Service Tampa Bay Florida | Steinway | Boston | Essex | Kohler & Campbell. All Rights Reserved. Theme By: Thirteen05 Creative.